The first thing we noticed when we walked into Square Peg was the young woman standing awkwardly close to the door. “Welcome,” she greeted us. As I prepared to tell her our name, she directed us to a counter over her left shoulder. “You can check in with the hostess over there.” A little baffled as to what exactly her job was (greeter?) we made our way to the hostess counter to let them know that we had arrived a bit early for our 7pm reservation. We were prepared to grab a drink at the bar but there were plenty of tables and they walked us over to a small 2-top by the kitchen. Prime spot for watching all the food pass by! Our waitress delivered our menus, took our water order (seems a bit ritzy for a place like this, no?) and returned a few minutes later with our ice water and an adorable glass bottle of water for the table. I love when restaurants do this. I’m a thirsty gal and hate to have an empty water glass, almost more than I hate to have an empty wine glass. As I admired the bottle, we perused the drink menu. Square Peg has adopted the “drink local” agenda with an impressive list of local to the U.S. spirits. Combined with an exciting cocktail menu–Frisky Whiskey! !–we had more than enough options. I was in a whiskey kind of mood and went with the Whiskey Cocktail (Jim Beam Rye, maraschino, combier liquer and an orange twist) while my husband opted for an Old Fashioned (Wild Turkey bourbon, agave nectar syrup, bitters, muddled cherries and orange.) We told our accommodating waitress that we wanted to enjoy our cocktails prior to ordering, as if we were grabbing a drink at the bar before dinner. She happily agreed and checked in on us occasionally but not too annoyingly. 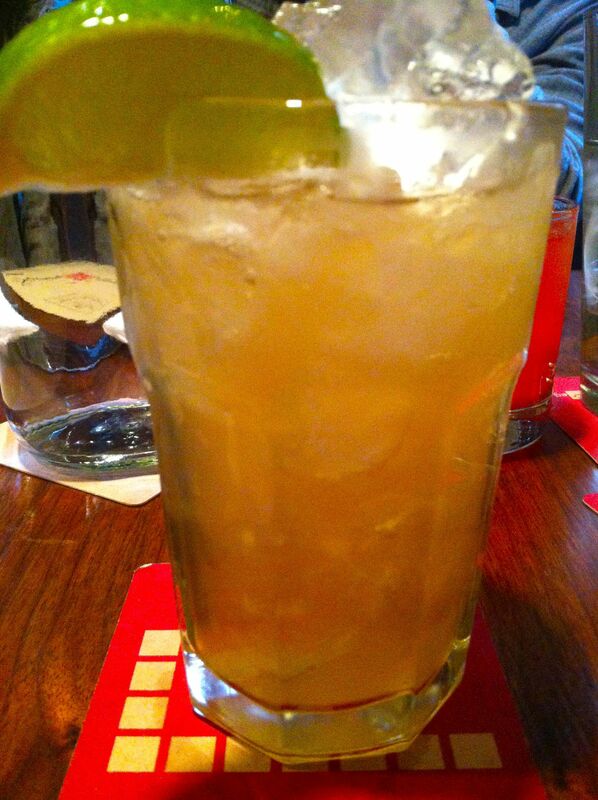 The drinks were tangy and well-mixed. I did notice that there was a slightly older crowd when we came in, and I assume it was the theater crowd. As the night progressed, however, the crowd grew noticeably younger. It will be interesting to see how this food-forward place caters to the sometimes tame pre-theater crowd while maintaining its integrity and mission. As we enjoyed our drinks, we spent some time perusing the menu. Who am I kidding. I already knew what looked good to me thanks to the good old internet, but I still hadn’t made any final decisions. Although 2012 has marked the beginning of a quite successful healthy lifestyle kick, the weekends are our cheat times and we certainly made it count at Square Peg! 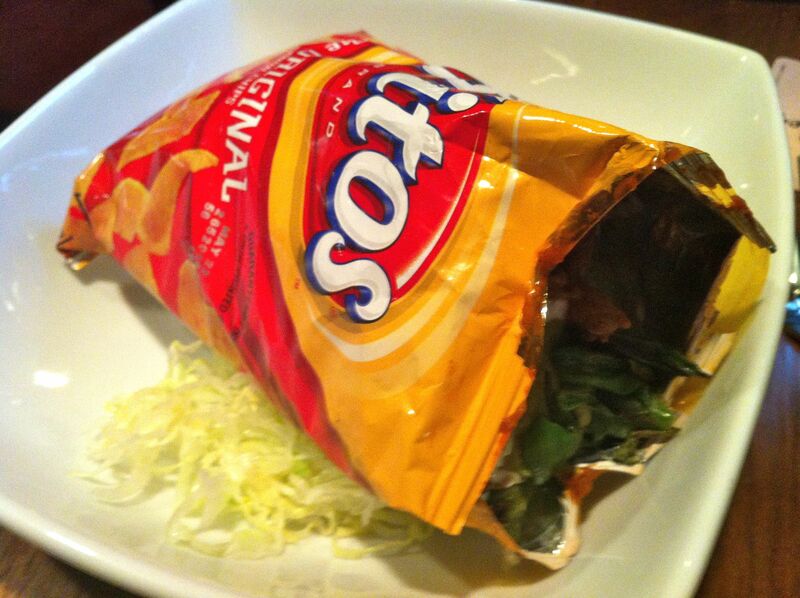 We ended up choosing the mac and cheese “grilled cheese” with drunken tomato soup and the tacos in a bag to start. My fabulous husband knows how difficult it is for me to leave a restaurant without ordering their version of mac and cheese and Square Peg’s certainly didn’t disappoint. The buttery bread perfectly contained the cheesy mac such that it didn’t fall apart when you dipped it into the tangy tomato soup. Cheese, butter, carb, tomato–there’s pretty much no better combination. 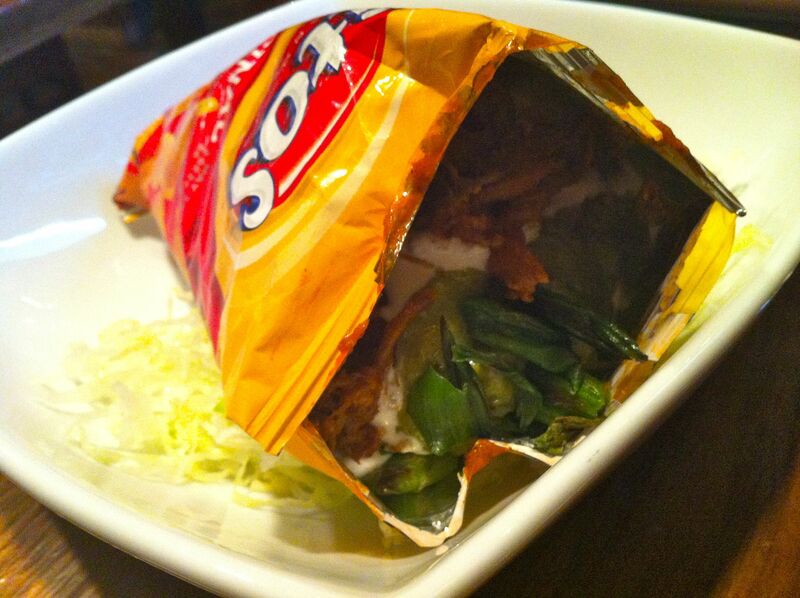 The tacos in the bag were interesting. It came to the table and we looked at the dish. We rotated it and looked again. “What are we supposed to do?” we whispered to one another. I tugged gently at the top, wondering if they had made a slit that would allow us to open it. No dice. What the hell, I thought. And dumped it out. OK, by that time I was full. Too bad the entrees were on their way and I was EVEN MORE EXCITED for them. 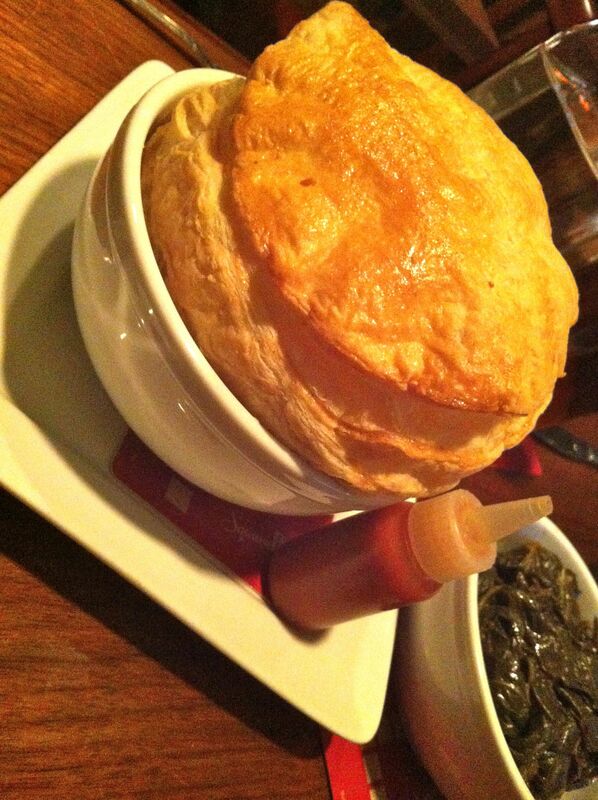 Ever since the moment I laid eyes on the menu, my eyes gravitated to one thing and one thing only: cheesesteak pot pie. For someone who didn’t eat meat for as long as I did, mention the word cheesesteak and I just swoon. Cheesesteak spring rolls? Yes, please. Cheesesteak pizza? Check. Cheesesteak pierogies? Well, you get the idea. Had ’em all, love ’em all. Not to mention, friends had been there a few days earlier and the pot pie came highly recommended. How cute is that little spicy ketchup bottle alongside the dish? I also ordered a side of collards which were my best attempt at getting something healthy. The pot pie, as expected, was phenomenal. While I enjoyed the flaky topping, the real winner was under the crust. The meaty, rich, creamy, cheesy pot pie filling was just plain delightful. In fact, I couldn’t finish it and had the second half for lunch the next day. Score! My husband got the other highly recommended dish on the menu, the BBQ brisket with brown butter gnocchi. When he ordered, the waitress told him that it was being served with pappardelle that night, which was fine with him. However, our friends said theirs was served with pappardelle as well. Is this a menu change that hasn’t been updated on the printed menu? A friend who went to the friends and family opening had that dish and thought it to be quite heavy. I wonder if they recognized that and subbed the gnocchi out. 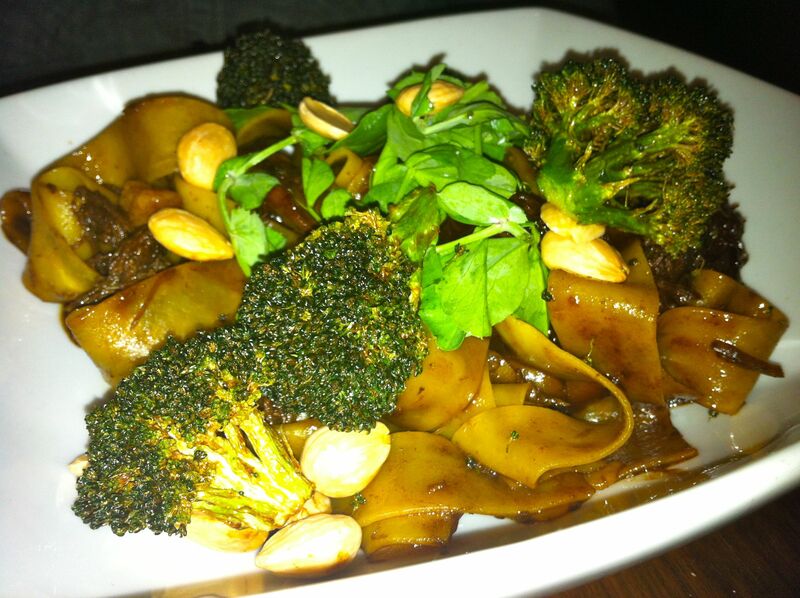 While the menu said nothing about the roasted broccoli and marcona almonds, they were both pleasant additions to the dish. I’m a pasta girl and I thought this was buttery and salty without being overly done. My husband thought it was a touch heavy, although I didn’t get that–granted you’re talking to someone who just ate a cheesesteak pot pie so maybe my sense of “heaviness” is a bit skewed. While we were finishing up our entrees, the General Manager, Michael Spector, came over to chat with us. What a nice guy. Michael owned the recently-closed Delicatessen on 7th and Chestnut and stepped in to manage Square Peg during its opening. Throughout our meal, I noticed Michael wandering the dining room, greeting people, asking about their meals and checking on every detail, down to the light dimmer. After the theater crowed (read: old) people left, the room got noticeably darker. His attention to detail and his concern for the restaurant’s patrons was evident in not just him but all the staff from the aforementioned greeter to all of the servers. It made us want to be there. It’s times like these in my relationship that remind me just why I married my husband. We were getting ready to leave when he asked if I wanted to split one of the “adult milkshakes.” I love this guy. 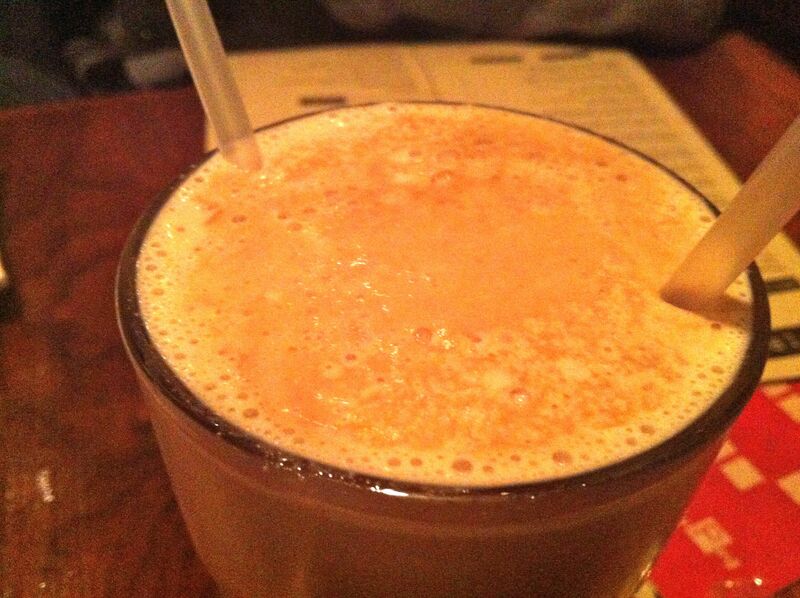 We ended up with the “Root Beer Float” with White Tail Caramel Whiskey, Root liquer, vanilla vodka and chocolate. I can’t remember the last time I had a milkshake but this certainly made up for it. It tasted exactly like a root beer float in milkshake form! All we needed was two straws. I’m probably going to get in trouble for posting that. We were a fan of Chef Matt Levin’s at Adsum and were excited for the opportunity to try his cooking again. While Levin absolutely proved his culinary skill during his time at Lacroix (hello, four bells!) Adsum and now Square Peg seem to be a divergence from that. He is cooking food that he wants to make and having fun with it. While it could be defined as stoner food, could be written off as kitsch, I challenge anyone who criticizes the concept to come on in and taste the food. While I wouldn’t mind a few lighter options, I think Square Peg has inched its way into the world of fun, creative and–most of all–damn tasty food. Although there wasn’t much of a bar scene while we were there, I think the great drinks list and unique menu offerings could make this a great Center City location for a beer (or a whiskey) and a bite. I’ve been looking forward to your review (with pics!) and it didn’t disappoint! 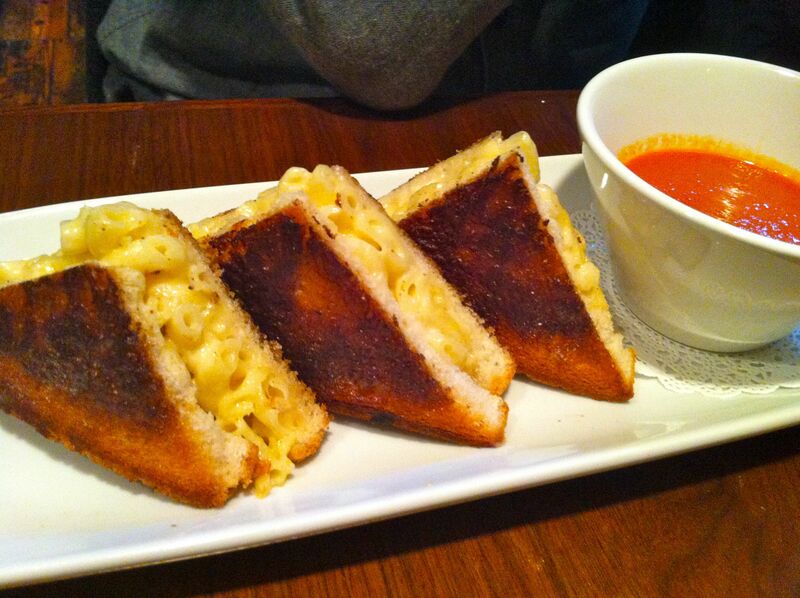 OMG how good does that Mac n Cheese Grilled Cheese look? I’m going to need to go there soon! 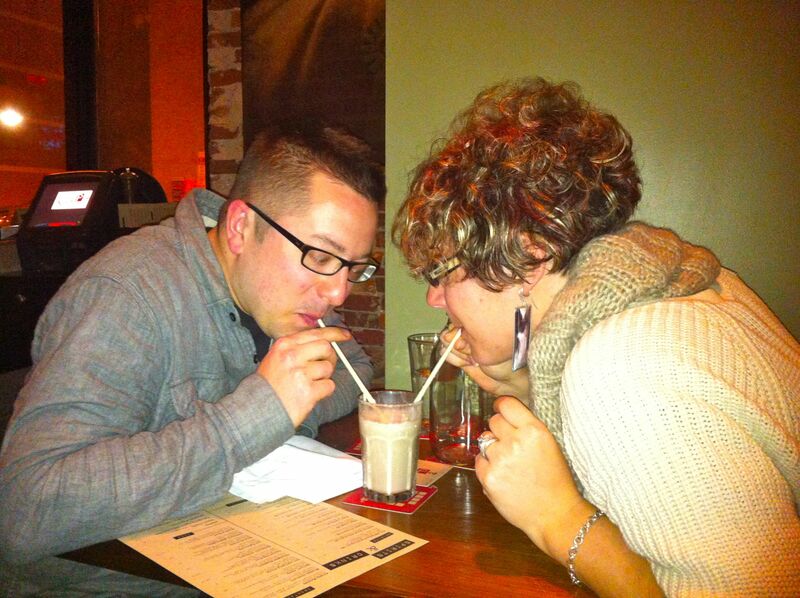 Adult milkshakes? What could be better?! Mac and cheese AND grilled cheese? 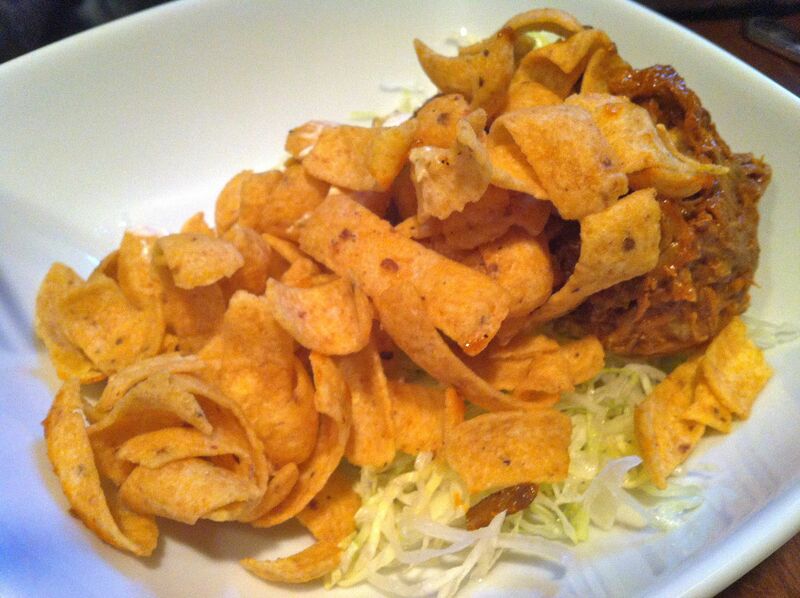 Holy carb overload Batman– I so can’t wait to try this! Photos gorgeous and gross at the same time! I gained weight looking at them. Guess my age is showing!